Now that's some good copy right there. Great grandpa's probably not around anymore. How do we know he wasn't more of a Legman? It's pronounced Oss-man my oss! Didn't you want to just cuddle up with the Momma after seeing that? She would have torn the face off of ANYTHING that approached them! Honey Badger made the leopard change its spots - or at least its shorts. I just checked and the average leopard weighs more than 60 pounds and is 5+ feet in length. The average honey badger weighs about 20 pounds and is maybe 1 1/2 or 2 feet long. This was like a a 10-year-old boy attacking Nassir Little and Little flees for his life. What a great clip. 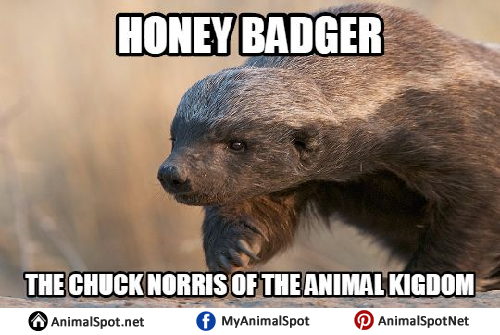 It turns out that the honey badger is named by Guinness Book of World Records as the “World’s Most Fearless Creature,” and is apparently more closely related to the marten family than it is to badgers (and so was originally misnamed). Like the wolverines it is considered to be another form of outsized weasel. Wow... had never seen that but I am so so so glad I did! Great stuff! Great, now I have this tune in my head but now it’s Peter Griffin instead of Yoda doing the singing. You are glad now, but see if you can rid your head of that earworm in the next few days. Duke v Kentucky a different perspective. This is about as bad a first touch... followed by as good of a second touch... as you will see in a key situation. Here is longer video of the giant spider from the above video... with a warning: there is a decent chance the images of this beast will haunt your dreams for a long time.